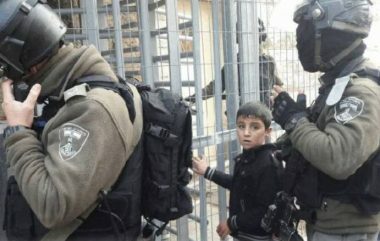 Israeli soldiers abducted, overnight until Thursday at dawn, nine Palestinians, including a child, only nine years of age, in several parts of the occupied West Bank, the Palestinian Prisoners’ Society (PPS) has reported. The PPS said that the soldiers invaded many homes in the southern West Bank governorate of Hebron, and abducted three Palestinians, identified as Mohammad Ammar Da’na, only nine years of age, in addition to Mo’men Ayoub Qawasma and ‘Adel Barkat Gheith. In Jenin, in northern West Bank, the soldiers abducted Sharaf Abu ‘Obeid, from the al-Yamoun town, and Mohammad Saleh Saba’na, from Qabatia town. In Tulkarem, also in northern West Bank, the soldiers abducted Ezzeddin Abu Dayya. In Ramallah, in center West Bank, the soldiers abducted Sa’id Nakhla, from the al-Jalazoun refugee camp. 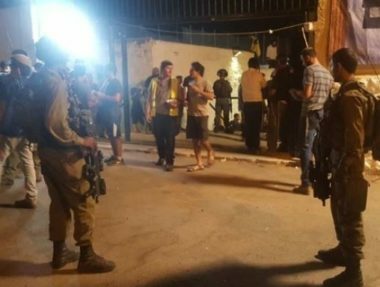 In Bethlehem, south of Jerusalem, the soldiers abducted Shadi al-Badawna and Yousef Mohammad Salah.